HPO Android 29 Tool is a small application for windows computer created by HPO Team, which allows you to flash the stock firmware om Qualcomm Smartphone and Tablets. 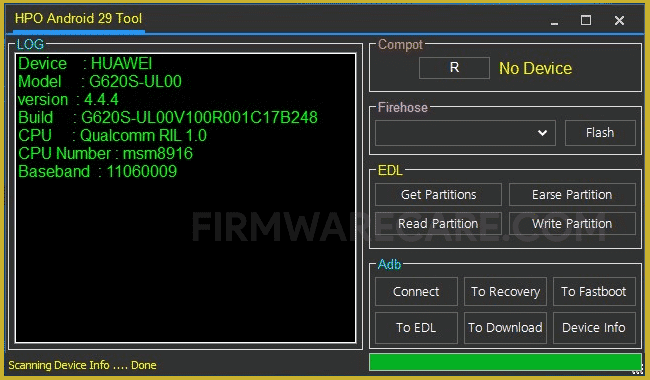 It allows you to flash the FireHose based Stock firmware on Qualcomm smartphone and tablets. Using the EDL mode, it allows you to Get the Partitions Information, Erase any Partition, Read any Partition, Write a New Partition. It also allows you to perform various other tasks i.e Connecting the device into the ADB mode, Booting the device into the ADB Mode, Booting the Device into the Fastboot Mode, Booting the Device into the EDL Mode, Booting the Device into the Download Mode, Getting the Device information. In order to use the HPO Android 29 Tool, you need to install the Universal ADB Driver on your computer. [*] Compatibility: The HPO Android 29 Tool runs perfectly on Windows XP, Windows Vista, Windows 7, Windows 8, Windows 8.1 and Windows 10 (32 bit and 64 bit). [*] Credits: HPO Android 29 Tool is created and distributed by HPO Team (developer). So, full credits goes to Miracle Team (developer) for sharing the tool for free.